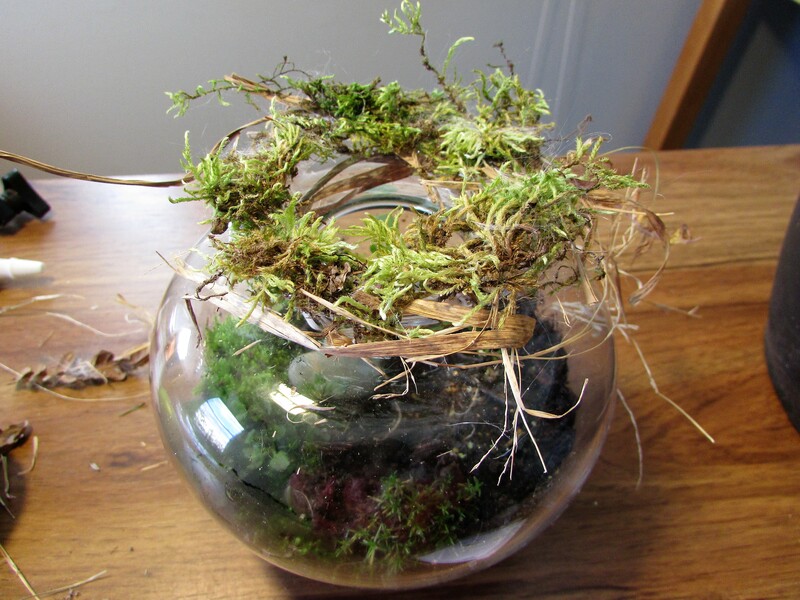 One of the pitfalls of creating a terrarium is finding the perfect stopper, or lid, that will not detract from the beauty of the planted jar or vase. I wanted to follow through on the natural theme, but also hoped to find something entirely unique to seal in the moisture. For the natural, I placed some double stick tape on the top of the vase, and wound several strands of dried grass around the rim. Next I glued a few pieces of dried moss to the rim. I finished off the natural elements with some skeletonized hydrangea flowers. These beautiful blossoms naturally lose their flesh when left beneath the bush through the winter. I find them beautiful, and they are not as fragile as they look. I always let a few strands of my arrangements behave in an unruly manner, in this case, a few pieces of grass and buds unfurling from side give the arrangement a bit of whimsicality and movement. 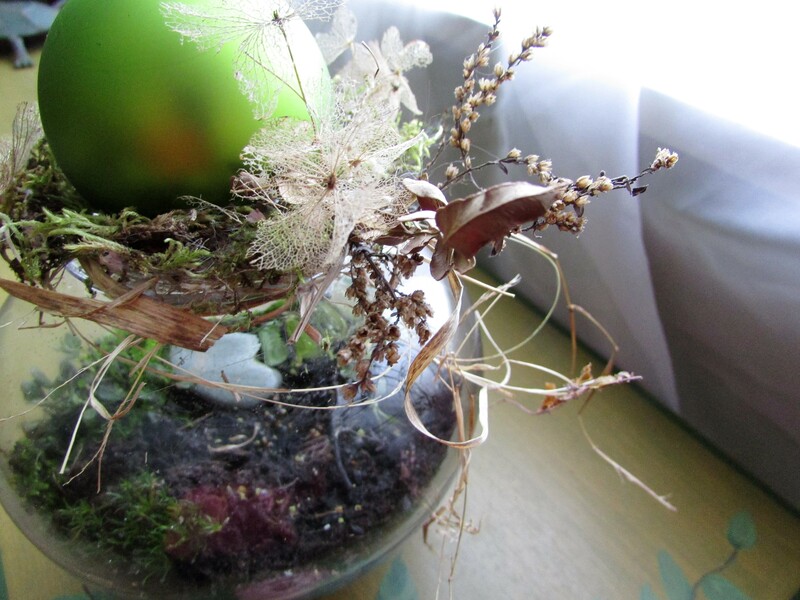 Lastly, I placed a beautiful moss green Christmas ornament on the top of the vase to work as a stopper/lid. I love the way the color of the Christmas ball mirrors the color of the moss inside the terrarium. The arrangement/terrarium looks good from several angles, top and sides. 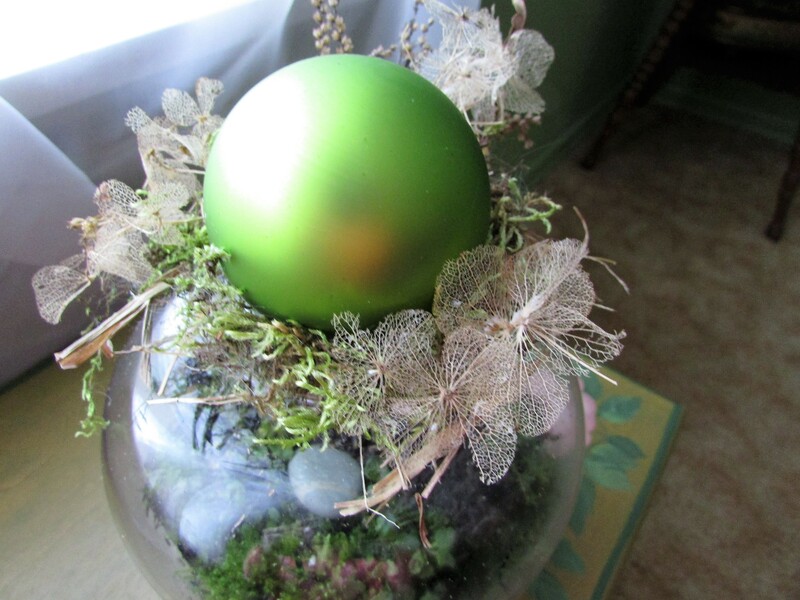 The Christmas ball reminds me of the Gazing Balls that many have on pedestals in their gardens. I looked at this first on my phone and then had to see it on the computer screen where it was more life-size. 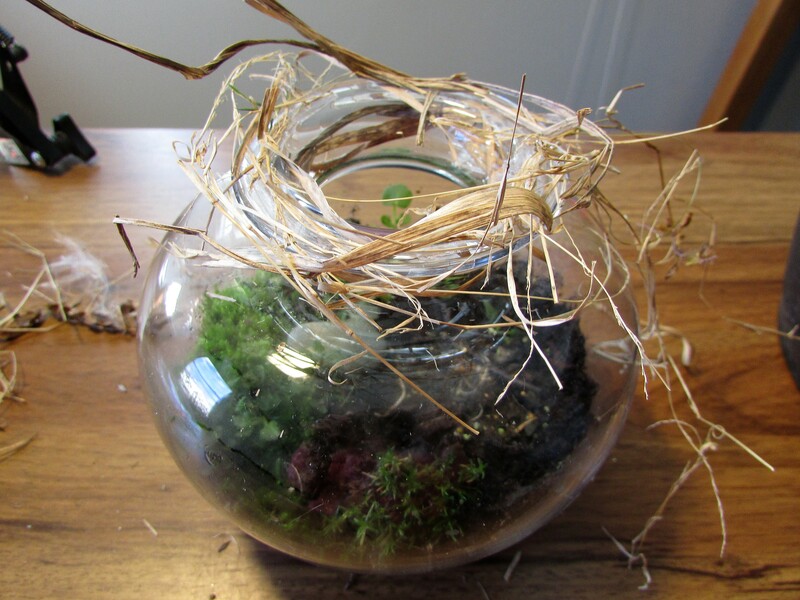 Terrariums were always a favorite of mine, although I never made one myself. Yours is very pretty. Thanks Anne. I like it, and even better, it is small, so it can be moved to many places easily. 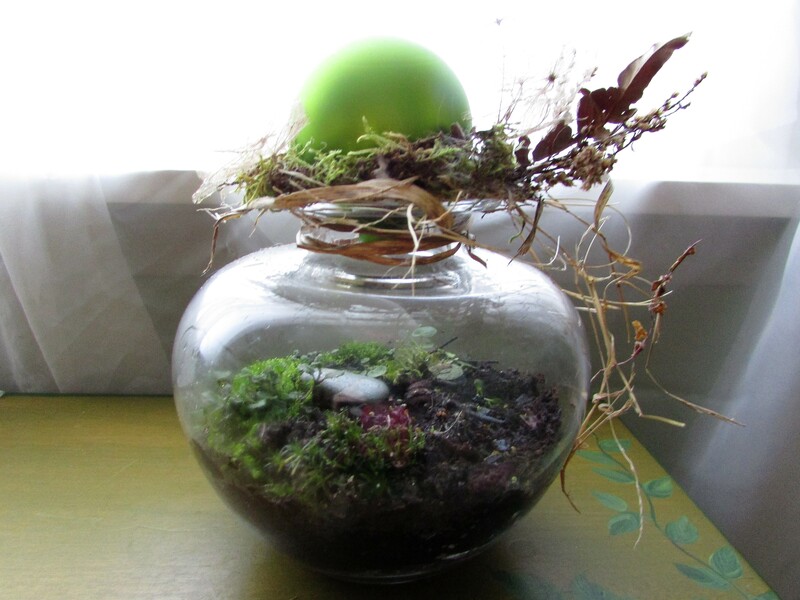 Thanks Ruthie, I love the way the terrarium combines the natural with the manmade glass. I especially enjoy them in having things like this about in the middle of the winter. Years ago I had a terrarium but this one is way cooler!. Love the Christmas ornament on top. I have no problem making the terrarium pretty…it’s closing it…so this both pleased and amused me. Thanks! I loved the Christmas ornament and it’s colour. Thank you, and thanks for stopping by my blog today. Yes, I so agree about the color…it is soothing to the soul I think…that lovely shade of green.